Installed as Opus 11682 of the M.P. Möller Organ Company of Hagerstown, MD, in 1986, the Cathedral’s present pipe organ is the result of the generosity of many donors from the parish and across the Diocese of Birmingham. Consisting of four manuals and 55 ranks of pipes, its design, featuring Möller’s largest free-standing case, is enhanced by the Cathedral’s wonderful acoustics. One of Möller’s later works, it is unique in that even though it is clearly of 20th Century design, it incorporates some characteristics of Baroque organs (the organ is fully encased and divisions are discrete therein, each division has a complete principal chorus, wind pressures are low) that are rare in Möller’s oeuvre. A product of collaboration by music director Stephan Calvert, consultant Joe Schreiber, and voiced by Donald Gillett, the former principal and tonal director of the Aeolian-Skinner firm, it was designed to play most of the organ repertoire with authority. As is typical of the “American Classic” style, a French accent (present in the chorus reed stops as well as the Great Harmonic Flute and “fonds d’orgue”) is balanced by more German elements (an incisive Positif, most flute stops, and complete choruses in clear contrast to each other). A chancel division in a portable, free-standing case was installed at the same time (playable from the gallery console or its own keyboards), but was sold in the late 1990’s or early 2000’s during the tenure of the late Calvert Shenk. Otherwise, the organ is unchanged since its installation. Visit its entry in the OHS Database for more information. After the passing of its 30th birthday, the Möller organ is in near-decrepit condition. While (thanks to the Cathedral’s glorious acoustic), this is not always readily discernable by the listener, recent years have manifested a number of serious flaws. These include: the pipework (weak zinc alloys that effect nearly 1/2 of the pipes in the organ, causing speech problems and failure); control system (1930’s technology which relies on pneumatic pouches, for which leather is rapidly failing, or already has); layout (the original design does not even permit tuning access to a sizable part of the instrument); and tonal design (Möller’s on-site voicing was insufficient and is further compromised by the failing zinc languids, so that many pipes do not speak on time). None of these flaws could be predicted at the time of installation. 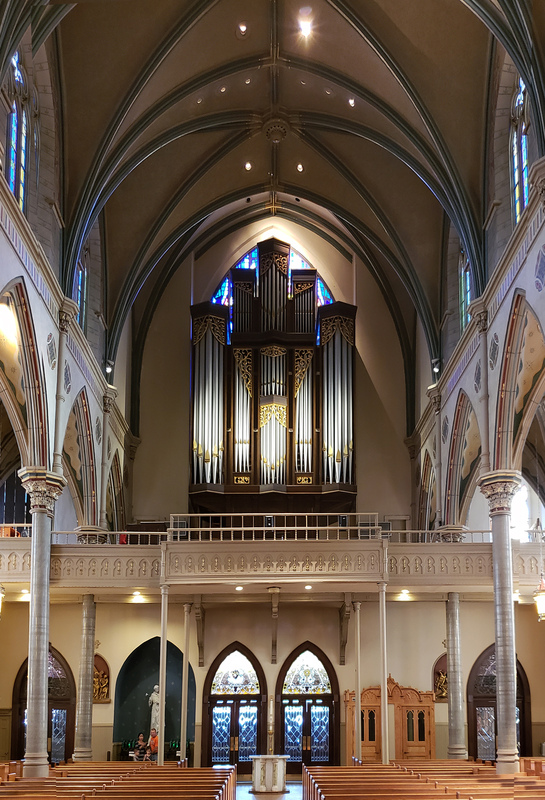 To help ensure the Cathedral’s tradition of fine organ and choral music, on January 25, 2019, a contract was signed for Opus 164 of the Noack Organ Company, a three-manual instrument with 75 ranks of pipes, reusing some pipework of the Moller organ. This was made possible chiefly through the extraordinary generosity of the late Anna Catharine (Kidd) Grace, devoted parishioner and supporter of many musical and liturgical initiatives through the Diocese of Birmingham. All the same, donations are still needed to cover the remaining portion of the contract price. For more information, please contact the the Director of Music, Mr. Bruce Ludwick, Jr., at Ludwick@stpaulsbhm.org or (205) 251-1279 ×107. A donation to a project such as this is a perfect way to give glory to God and memorialize or pay tribute to a loved one, helping their memory “sing on” for years to come. You may donate in person, via cash or check, via the button below, or by visiting this link: https://stpaulsbhm.churchgiving.com/ws/opportunities/organ.